There are two kinds of people in this world, one, who hate The Sims game series, two, who are totally in love with this game. However, we are here with something for the second kind of people. Many of you must have played the previous version of the game on laptops or PCs. Here we bring you the latest Android release of the game which is available for free on Google Play Store. 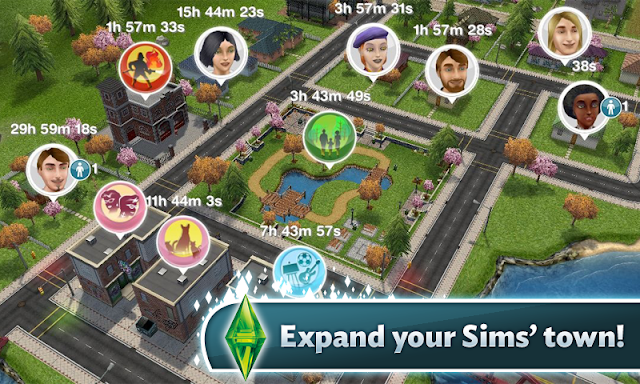 The game is a perfect combination of Sims and Farmville type gameplay which requires the player to return again and again in order to check what is going on and what needs to be done to achieve goals. Here we are going to provide you The Sims Freeplay APK file using which you can sideload the application on your device. But before that, let us have a look at some basic features that the game offers to its players. The game allows the player to customize up to 16 Sims. The type of Sim one wants to be is totally upon the player. He or she could be a wealthy tycoon or just a crazed loon. Build your own houses as you want or buy fully furnished ones via your daily earned cash in the game. Complete various tasks to earn cash in the game and complete goals to level up and progress further into the society. The player can also tend garden or take up a job to earn more money in the game. Earn life points and use them to instantly complete various goals and objectives. You can also download the game directly from Google Play Store for free. However, you require a stable and fast internet connection on order to download the addition 600 mb+ data on your smart device. You can also download the APK file from the link provided below and then transfer it to your Android smartphone or tablet and install it.